The Castle was completed in 1908. 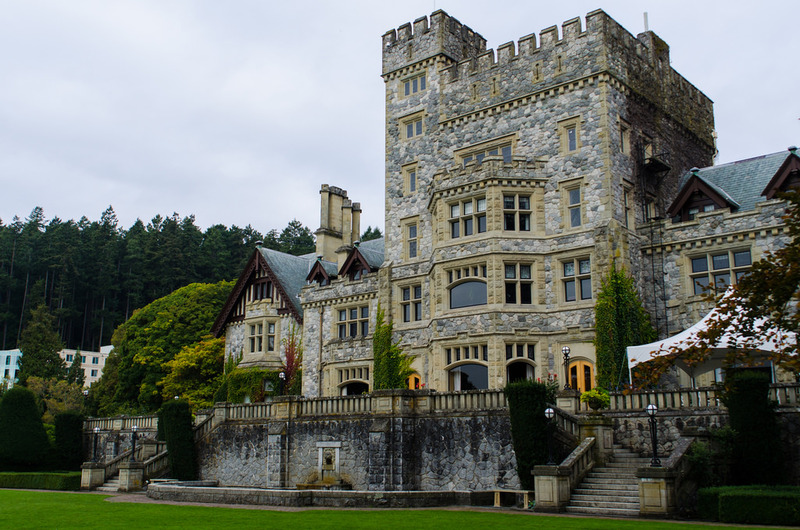 From 1941 until 1943 when Grant Block was completed, the Castle served as dormitory and mess hall for cadets and staff officers at Royal Roads Military College. It is now the administrative centre of Royal Roads University. 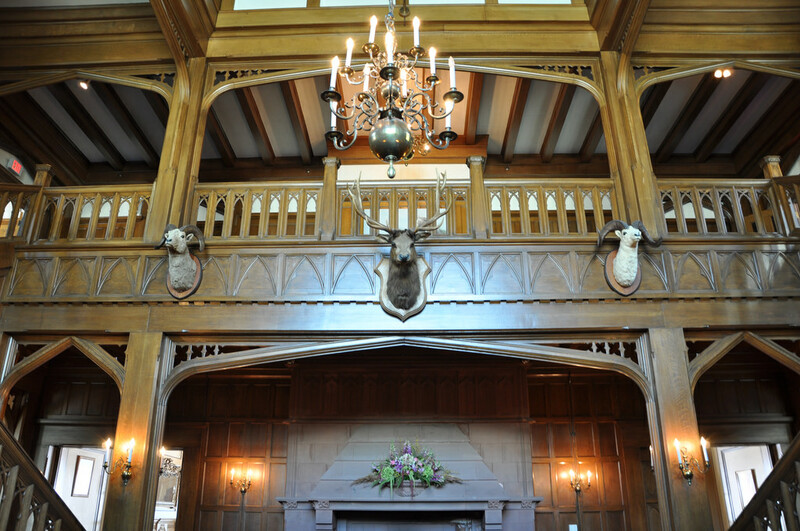 It houses the President, Vice-President, the Managers of Finance and Facilities, and the administrative support staff for Royal Roads University. The building is 200 feet long and 86 feet wide; the turret is 82 feet high. The wall surrounding the estate, also built of local stone, cost over $75,000; the Conservatory, costing a like amount, was at one time filled with white orchids imported from India; a large banana tree grew in the centre under the dome. The rooms of the house were filled with flowers from the Conservatory throughout the year. Ten kilometres of road interlaced the estate, and a hundred men were employed in the gardens. There were a number of other buildings on the estate to provide for the needs of the large household, but many of these have now been demolished: the vast refrigeration plant; the cow stables; the slaughter house and smoke house; the three silos, each of 100 ton capacity; the reserve water tank to the south of Belmont Drive; the old stable near the bridge to the east of the present fields; to say nothing of the Chinatown to accommodate 80 to 120 gardeners. There remain, however, the model dairy and the stables, which were of solid brick and concrete construction. 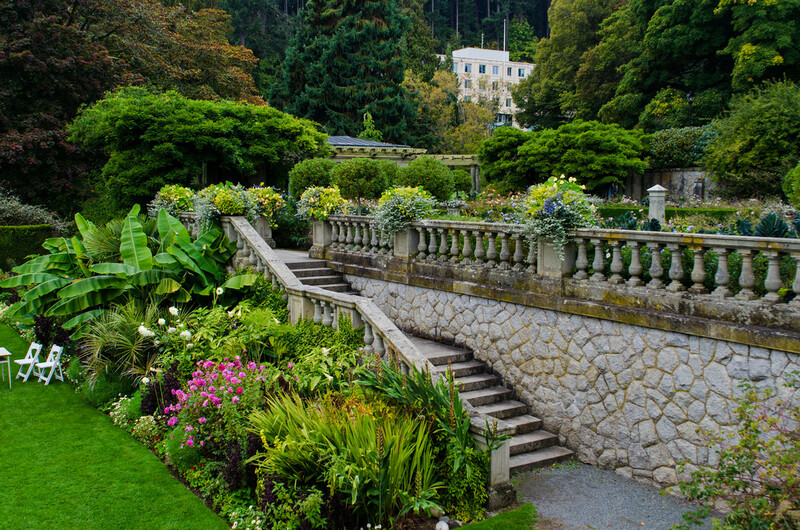 The “Castle” was completed in 1908, and the Dunsmuir family took up residence in that year. Early in 1910, James sold his collieries, his coal rights in the Esquimalt and Nanaimo Railway belt, and all his business connections therewith to Messrs. MacKenzie and Mann, railway promoters for $11,000,000. He thus separated himself from all former business with which the name of Dunsmuir had been associated. He then retired to enjoy his beautiful home, his yacht “Dolaura”, his shooting, fishing, golf, etc. He died in May 1920, at the age of 69. His wife, formerly Laura Surles of North Carolina, lived on at Hatley Park with her daughter Eleanor until she died in August, 1937. Eleanor died six months later. For the next three years, the estate was left in the hands of a caretaker. In November 1940, it was purchased by the Dominion Government for $75,000 to begin its career as a Naval Training Establishment. No time was lost. On 13 December 1940 HMCS Royal Roads was commissioned as an Officer Training Establishment for short-term probationary RCNVR sub-lieutenants and operated as such until October 1942. During this time, some 600 volunteer reserve officers underwent training. Then, on 21 October 1942, the training of regular force naval cadets was re-established in Canada, and the spirit of the old Royal Naval College of Canada was reborn with the establishment of the Royal Canadian Naval College at Royal Roads. After a brief history of five years, the Royal Canadian Naval College became, in 1947, the RCN-RCAF Joint Services College. The following year, with the admission of army cadets, Royal Roads became the tri-service College known as the Canadian Services College Royal Roads. In 1968, the name of the College was changed to Royal Roads Military College. The College continued as a two year feeder College for the Royal Military College and College Militaire Royal de Saint Jean until 1975. On 25 June 1975 the Royal Roads Military College Degree Act was passed allowing the granting of degrees. The first class graduated from Royal Roads in May of 1977. The first class of postgraduate students graduated in the fall of 1989. On 22 February 1994, it was announced that Royal Roads Military College would close in the following year. Due to public support, the Province of British Columbia entered negotiations with the federal government of Canada to lease the property and facilities in order to continue its use as a university. Royal Roads University was created on 21 June 1995 by an act of the Legislative Assembly of the Province of British Columbia. On 31 August 1995 Royal Roads Military College ceased to exist and the facilities were turned over to Royal Roads University on 1 September 1995.